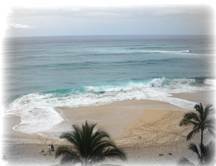 Oahu/Beachfront = The Hawaiian Princess Unit 1104 Online Booking Now! This unit has been totally up-graded. There is hardwood floors, new rattan furniture, ceiling fans, and new kitchen appliances. The decor is tropical island and the ocean view from the 11th floor is awesome! The Hawaiian Princess is nestled on a secluded, pristine cove on the West Coast of Oahu. You will enjoy an unobstructed ocean view from your private lanai. The front of the building faces the magestic Makaha Mountain Range. Our cove is home to sea turtles and many colorful tropical fish. Some of the best snorkeling on the island is steps away from your unit. When a swell comes in, boogie boarders and surfers hit the surf. During whale season, you can watch whales playing right from your lanai. Spinner dolphins frolic in front of the building year around as do the sea turtles. The dolphin tour boats often stop in front of the Princess to watch them. You'll have the option of lounging by the pool, taking a dip, or relaxing in the jacuzzi. If you prefer the ocean, it's a few steps away. Snorkel, boogie board, surf or just bob in the clear, clean warm salt water. Sunsets on the West Coast of Oahu are the most amazing on the Islamd. Every night is different, and once again, you will have a front row seat right from your condo's living room and lanai. If there's a full moon during your visit, you will be able to enjoy the large silver path on the ocean in front of you. Sit on the beach at night and star gaze, then return to your comfortable tropical retreat and fall asleep to the sound of the surf. Over looking the cove from the 11th floor. Unobstructed Ocean view of the ocean and cove below. Totally up-graded, fully equipped kitchen. New Dining Room furniture. Eat and enjoy the ocean view. Comfy tropical bedroom with queen size bed and the sound of the surf. Enjoy conversation with friends and family while in the kitchen. Great place for casual dining. Cancellations and Refunds: Cancellations and Refunds: Deposits are refundable less a $50 administrative charge for cancellation requests made at least 45 days prior to the scheduled arrival date. Do to the fact that most of our traveling guests book two or three months in advance, guests canceling less than 45 days before arrival will receive refunds only if the unit is rebooked for their reserved dates. We make every effort to rebook any cancellations but we recommend you purchase travel insurance if unsure.